A bustling trade fair illustrates the possibilities—and limits—of Beijing's engagement in the region. Welcome to the 10th annual China Fair Jordan 2013, an event proclaiming itself the “Largest China Fair in the Near East.” Set in two weeklong sessions in September, the exhibition features over a thousand Chinese suppliers displaying 12,000 made-in-China products for customers from across the Middle East. The fair coincides with King Abdullah II’s trip to China this week, which is the Jordanian monarch’s 7th official state visit to the country since 1999. As the world negotiates over neighboring Syria and the Jordanian people worry about refugees and chemical attack, Abdullah is touring the Huawei research center, Shanghai’s Jinqiao economic zone, and the first China-Arab States Expo in Ningxia, a northwestern province known for its sizeable Muslim minority. King Abdullah’s interest in China reflects the closer ties between the two countries; Chinese-Jordanian trade has grown at steady double-digit rates in the last decade and China is now Jordan’s 3rd largest trade partner, all while war and political instability have thrown Jordan’s neighbors into turmoil. Both Chinese and Jordanian governments endorse the fair, which is organized by the Jordanian events company Petra Travel and Tourism in conjunction with Meorient, a Shanghai-based firm that specializes in holding Chinese product expos around the world. Binu Pillai, the Meorient chief operating officer, is a quick-speaking, smartly dressed Indian who previously worked in Dubai. His business card is in Chinese. Jordan is ideally located for the expo, Pillai says, because of its proximity to Syria, the Palestinian Territories, Egypt, Lebanon and Iraq, all countries with market potential but also political instability. Wael Kawar, managing partner of Petra Travel and Tourism, also calls Jordan a “hub” for the Levantine countries, most of which, in contrast to the Gulf States, have little oil. Though the countries cannot satisfy China’s energy needs, they at least provide a market for Chinese goods. Gai Kuo, a 23 year-old student from China, is working at the fair as a freelance translator. She stands behind a large sign for “Ultra Filtration Membrane Production Machine,” which she describes as “some kind of filter for machines that make drinking water.” Kuo has lived in Amman for four years, studying Arabic at the University of Jordan. “My mother made me come because she thinks there will be development in the Middle East,” she says. Kuo plans to stay here after graduation regardless of the region’s political turmoil. 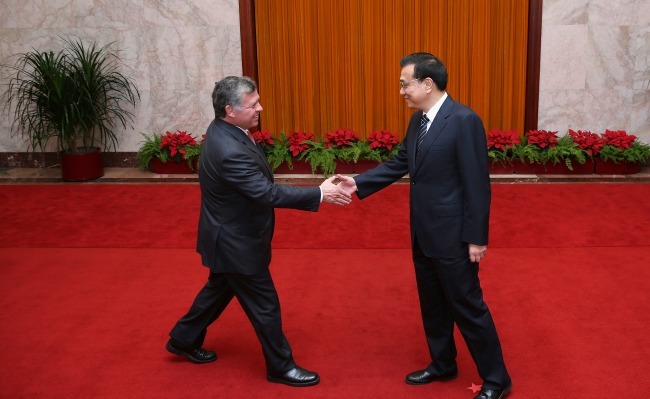 But despite the closer relationship between China and Jordan, even Chinese officials acknowledge that the Middle Eastern country’s most important bilateral relationship is with the United States. Prior to this trip King Abdullah had not gone to China in 2008 for the Beijing Olympics. In the years since, he’s visited America every year, often multiple times. “Jordan is America’s friend here; one of their few friends that is not a member of NATO,” Liu says. But there are signs that this balance is changing. Unlike the United States, China has good relations with countries across the region, even those who are at odds with each other. For example, China has held bilateral diplomatic and trade relations with both Iran and Saudi Arabia—mutual enemies—for decades. Beijing also maintains good relations with and sells arms to Israel, while at the same time endorses Palestinian statehood and right to self-determination. These relationships are consistent with China’s foreign policy approach, which Liu says favors “equality, mutual respect, and non-interference” over U.S.-style democracy promotion. The Chinese talk of “equality and respect,” though, seems to have more to do with the relationship between governments than to the people they represent. In the Middle East, China has long preferred to deal with the political status quo regardless of the country’s human rights situation. When asked what “respecting the people’s wishes” means, especially in cases of authoritarian regimes like Bashar al-Assad’s Syria and King Abdullah’s Saudi Arabia, Liu pauses. In China, the China-Arab States Expo is greeted with talk of historical friendship, based on the Silk Road and cultural connection with China’s Muslim Hui minority. But no mention is made of China’s other main Muslim ethnicity, the Uighurs, whose protests in their native Xinjiang were violently quelled in 2009. With these considerations, is China’s non-interference policy sustainable? At a hearing at the U.S.-China Economic and Security Review Commission this summer, some analysts claimed that the answer is no. “Chinese diplomacy is being forced out of passively managing risk,” Alterman said. Beijing’s increasing need for oil exports may also alter its diplomatic strategy. Recently, Al-Jazeera America similarly reported that economic overtures like the China-Arab States Expo reflected China’s concern for its oil markets. Securing a stable environment—free from political instability or war—is central to Beijing’s needs. But at least for Jordan, regional turmoil may actually be a good thing—as an oasis of calm in a turbulent region, Amman stands to benefit from both Chinese and American interest in its stability. At the China Fair in Amman, conversations do not revolve around human rights, reform, or the situation in Syria. Instead, both the Chinese and the Arab hosts are engaged in business talk, revolving around topics like corrugated cardboard and making deals with suppliers. According to Pillai, the fair’s success is marked by its continuous growth (this year’s edition is 30 percent larger than the 2012 show) and high rate of returning participants. “People come back when they make deals,” Pillai says. He rejects the stereotype that Chinese goods are cheap and poorly made. Jaafar al-Jaberi, a materials engineer for a Jordanian printing supplies company, says he has used Chinese machines since he first entered the business 18 years ago. He checks the quality of the goods personally and chooses Chinese ones over European equivalents. Al-Jaberi points at a corrugated cardboard machine that would cost €350,000 in Germany, he says, but only $50,000 in China. “If I order this machine in Europe, I have to wait two to three months. They have no labor,” al-Jaberi says. “In China, there are millions [of people]! It takes only one month to get the same machine from China”.